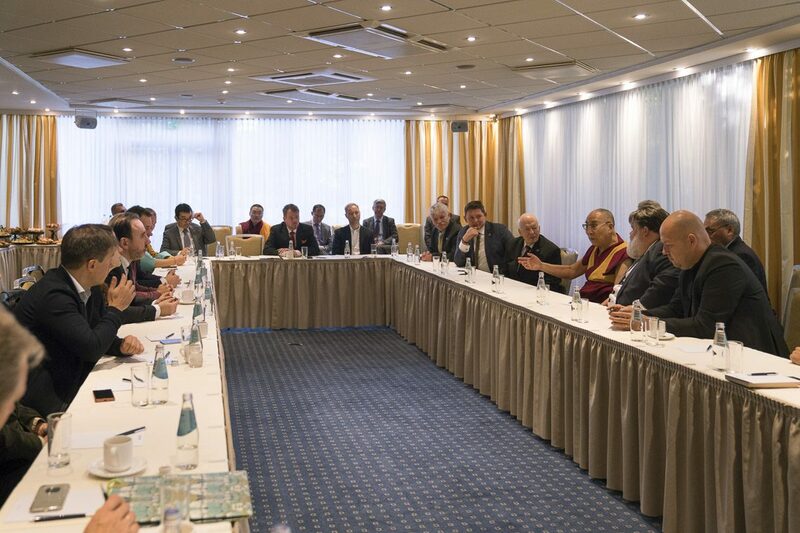 (TibetanReview.net, Sep26, 2017) – On the sideline of his ongoing religious teachings in the Skonto Hall in Latvia’s capital Riga, Tibet’s exiled spiritual leader, the Dalai Lama, on Sep 24 morning met with a group of members of parliament from the three Baltic states of Latvia, Estonia and Lithuania. The MPs who took part in the breakfast meeting included three each from Latvia and Estonia, including a former Latvian Minister of Justice, and four from Lithuania. Latvian MP Andris Buikis, who has for long been a supporter of the Tibetan cause and who is a member of the Tibet and Taiwan friendship groups in the Latvian parliament, reminded the Tibetan spiritual leader that the Baltic States had remained under foreign occupation rule for 50 years and he and his colleagues therefore understood and sympathized with the situation in Tibet today. Asked how the attending MPs could help Tibet, the Dalai Lama told them to express their concern for it whenever opportunities arose. He asked them to challenge the Chinese, when they say, as they often do, that all is well in Tibet, by demanding to go and see for themselves the situation of Tibetan language, education and culture, as well as the state of Tibet’s ecology. The Dalai Lama pointed out that contrary to the claims of the current leaders of China, Chinese scholars had noted that historical records from the T’ang to Manchu dynasties showed no reference to Tibet being part of China. He called this an evidence of how totalitarian systems try to rewrite history. He called the China-Tibet issue a struggle between force and truth and conceded that the power of weapons seemed vigorous in the short term. However, he continued, the power of truth will always be stronger in the long run. He thanked the MPs and assured them that their support was essential. The Dalai Lama had arrived in Riga in the morning of Sep 22. He was welcomed by members of the bodies organizing his visit, Saglabasim Tibetu (Save Tibet Latvia) and Save Tibet Foundation, Russia, joined by supporters and disciples from Latvia, Lithuania and Estonia, as well as from Russia, Kalmykia, Buryatia and Tuva.